The town of Blue Rock is in need. Many villagers are missing, and only Desmond can help you save them. Together, you must overcome the wrath of the wilderness and rescue the inhabitants of the withering town. 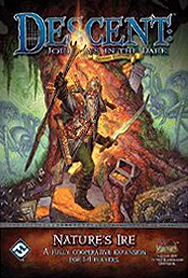 Discover a new way to play <>Descent: Journeys in the Dark Second Edition with Nature's Ire. This expansion removes the overlord player and allows 1 to 4 hero players to enjoy a fully cooperative experience. The heroes must explore a constantly expanding map while overcoming dangerous perils and completing diverse encounters, all before the forces of doom and fate bring about their untimely demise!